SAS: Phantoms of War is the history of the Australian Special Air Service. 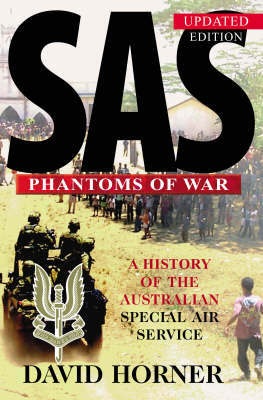 Originally published as SAS: Phantoms of the Jungle in 1989, and a bestseller since then, this edition has been updated to include details of the SAS's activities in the 1990s and into the 21st century.Based on patrol reports and interviews with participants, this Australian military classic tells the fascinating story of the formation of the SAS, its secret role in Borneo during confrontation with Indonesia and its operations in Vietnam. The SAS operated deep behind enemy lines, conducting surveillance at close range, poised to spring into violent action at need. It was with good reason the Viet Cong came to call them Ma Rung-'phantoms of the jungle'.After Vietnam, the SAS formed a crack counter-terrorist force, ready to defend Australia. It became involved in action in Somalia, Kuwait and East Timor in the 1990s and, in 2000, the security of the Sydney Olympic Games.SAS: Phantoms of War tells the story of a highly disciplined force operating secretly at the cutting edge of Australia's defence in war and peace.